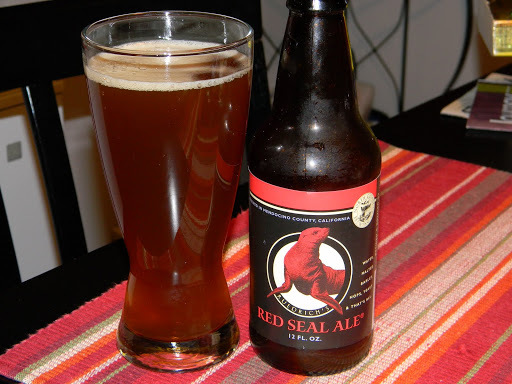 Review of North Coast Red Seal Ale | Beer Apprentice - Craft Beer News, Reviews, Interviews and Info. Today, I thought I would post another review from the North Coast Brewing Company located in Fort Bragg, California. This brew is called the Red Seal Ale. North Coast Brewing makes some really outstanding beers that seem to be enjoyed and applauded by all who try them. Let’s see what the website, northcoastbrewing.com, has to say about this American Amber Ale. I’m ready to give it a go. This beer has an ABV of 5.5% and comes in a 12 oz. bottle. The Red Seal poured a cloudy, amber/copper color with some burnt orange highlights around the bottom of the glass. A small, off white head, with not much retention, was developed from a medium, aggressive pour that left only a scant amount of lacing behind for me to gaze upon. The aroma provided a sweet caramel malt combined with some buttery notes and some bread and biscuit grains. A reluctant fruit and hop scent was observed, however they gave the impression of being, mostly, a complimentary aroma rather than a star player. The caramel malt was the most dominant of all the fragrances. The flavor let the sweet caramel malt shine even more, but this time the hops were more suggestive. They brought out an “earthy” and dark, citric hop profile. I got a slight, dark grape impression. The bitterness was comforting, but the sweetness was more domineering. The bread and biscuit taste counterbalanced the sugary sweetness a bit and, truth be told, gave it a slightly sour savor. All in all, not bad. The mouthfeel was medium, fairly smooth and somewhat crisp. It left a bit of flavor behind for an appealing aftertaste. Decent carbonation and a mostly dry finish make this beer go down pretty easy. Overall, this was a pretty decent beer. It’s solid all around and none too complicated. The caramel malt and bready notes were more commanding, but I didn’t have a problem with that. The balance was “ok” and the complexity was fair. The Red Seal Ale is right down the middle in my opinion. It’s definitely worth a try if you can find it. I could have a few of these during one setting with absolute ease. Thanks for reading everyone. It’s most appreciated.